Maintaining your truck is one of the most important aspects of ownership. Not only does proper maintenance ensure that everything is working as is needed for top performance, but it means that your vehicle will be able to survive a full lifetime. Vehicles these days are designed to easily hit 20 years of service, but it mostly depends on how active the owner is in maintaining the vehicle that determines whether the vehicle will live that long. A lazy owner will lead to major problems sooner than later. As such, it’s vital to understand what to check on, how often to do it, and the steps required to solving those issues. Our certified Ford experts at Mainland Ford have compiled this list of recommendations to provide you with the information you need to maintain your vehicle until it’s 20 years old or more. The first, and easiest, step in the recommended maintenance routine for your Ford F-150 is to check your tires and your spark plugs. Ensuring that tires are in top performing condition is absolutely critical to your safety and overall performance of your truck. Old tires or worn out tires have considerably less traction than tires in good condition. As a result, old tires put you at a considerably high level of risk. Sean Kane, president of Safety Research & Strategies, Inc. says to compare an aging tire to an old rubber band. He states “If you take a rubber band that’s been sitting around a long time and stretch it, you will start to see cracks in the rubber.” This is essentially what happens to an old tire when it’s put on a vehicle and driven. Cracks in the rubber begin to form, and may appear on the surface and inside of the tire, which F-150 owners should actively be looking for. Cracks, once they appear, can eventually cause the steel belts in the tread to begin to separate from the rest of the tire, and improper maintenance and heat will accelerate this process. 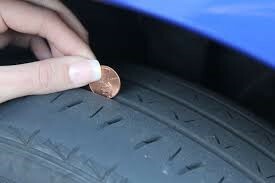 This process is easily avoidable by simply checking and maintaining your vehicle’s tires. Your spark plugs play a vital role in making sure that your truck functions absolutely as it is supposed to. 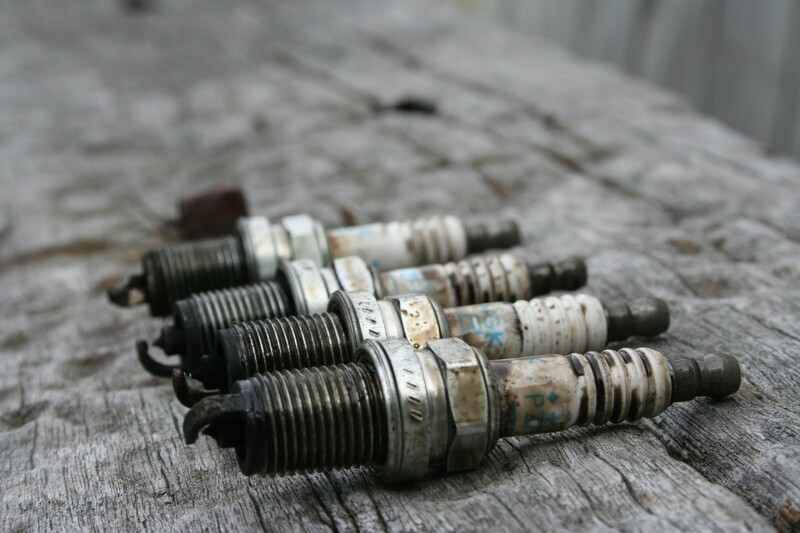 Spark plugs are pivotal in the process of converting gasoline into power, which drives your car. The spark plug provides the actual ‘spark’ that allows it to burn. As such, faulty spark plugs can lead to misfires which will lead to damaged cylinders and blown motors – two very expensive fixes for any vehicle (not just the F-150). Use the following information when inspecting your tires and your spark plugs to get the most of your truck. Check tire tread depth. The easiest way to do this is to use a US coin. US coins are exactly the right size to tell whether or not your tire tread is on its last legs. Simply put the coin into the tread, head down, and if the tread covers the most of the president’s head then your tread is in good shape. Alternatively, if you don’t have foreign currency readily available, simply check the tread wear indicator bar found in the tread. If this is flush with the tread itself then it is time to change the tire. Check your air pressure. This can be done using trial and error if you’re not using OEM tires, but otherwise refer to the air pressure stated on the door jamb sticker. Replacing your spark plugs will require a socket set that has a spark plug socket. The most important maintenance that an F-150 owner can do on their own, and should do regularly, is to check all fluids in their truck. Use the following information to see why it’s important to check your fluids, and how often you should check your trucks fluids. Why you should check: Engine oil keeps your truck’s engine lubricated, allowing it to perform it’s best. When your oil has gone bad, it starts to lose its lubricating properties, and when this happens it allows your engine to overheat due to internal friction. This can eventually lead to the engine itself seizing up and ceasing to function. 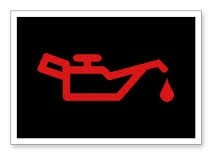 If necessary, add oil until your vehicle is at a proper level. Refer to your F-150 owner’s manual for type and amount. Change your oil every 5,000 to 11,200 kilometers. This can be around every 3 months or so, depending on how frequently you drive. 3.1.1 Changing your oil will require a socket set, oil filter wrench, and a drain bucket. Alternatively, bring your F-150 to Mainland Ford Service Department for an oil change. Why you should check: Transmission fluid, like engine oil, is vital to keeping your F-150 lubricated, which allows the important components that power your truck to cool to a proper temperature. Without properly maintaining your transmission fluid levels,parts can wear against each other, and will eventually lead to catastrophic transmission failure. Changing your transmission fluid is a slightly more difficult process than changing your engine’s oil, but it can still be doable for any weekend warrior. If necessary, add transmission fluid until your vehicle is at a proper level. Refer to your F-150 owner’s manual for type and amount. Change your fluid every 96,000 kilometers or so. Changing your transmission fluid will require a socket set, a new filter, and a drain bucket. Why you should check: Engine coolant is absolutely critical to ensuring that your engine does not overheat and subsequently die. Particularly in the summer, it is vital to ensure that your engine has the proper amount of engine coolant, as lacking coolant could lead to severe overheating of your F-150. 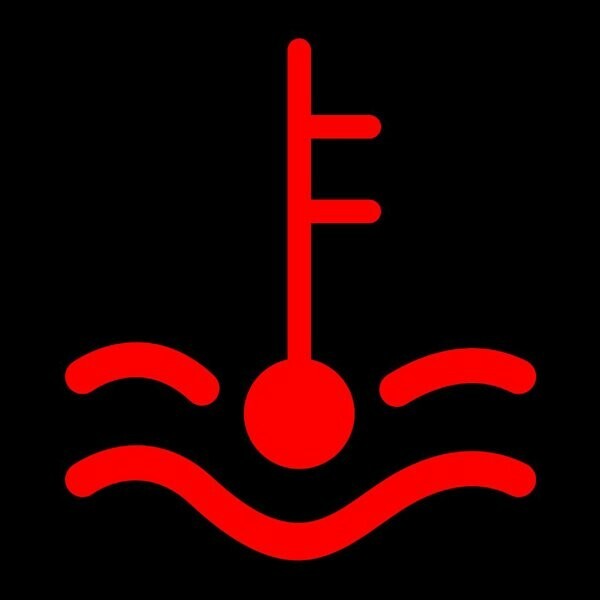 Check your coolant level every 2 weeks using the markers on the internal reservoir. Add coolant as necessary. Check your F-150 owner’s manual for type, though generally, a 50/50 antifreeze/water mixture is ideal. Change your coolant every 120,000 to 160,000 miles, as necessary. Changing your coolant will require a socket set, screwdrivers, a drain bucket, and distilled water if your coolant isn’t already pre-mixed. 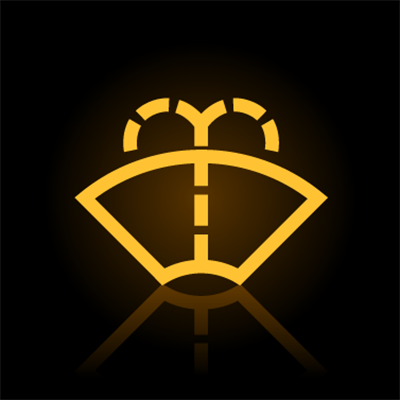 Why you should check: Brake fluid is one of the most important components of your brakes. It’s what makes the brakes themselves work, in that it uses the fluid to compress the pistons on the brake rotors, allowing your F-150 to stop when you need it to. The process of changing your brake fluid is a rather involved task, and is not recommended for amateur mechanics – particularly as properly working brakes are such a critical component of a working vehicle. 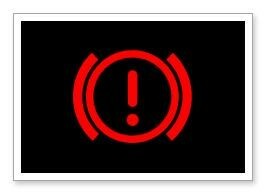 Check your brake fluid level on a bi-weekly basis, using the markings on the reservoir. Add fluid as necessary, referring to your F-150’s owner’s manual for type. Changing your brake fluid requires a socket set, screwdrivers, rubber tubing, a drain bucket, and an assistant to help out. Why you should check: Your power steering is one of the most important aspects in terms of maintaining a normal driving experience for your vehicle. Since your power steering pump is linked to your main drive belt, making sure there is a proper amount of fluid is an absolute necessity. You’ll know when your fluid is low, too, because you’ll hear a loud whining sound whenever you try to turn the steering wheel. If your reservoir runs completely dry, then it can cause the pump itself to seize up. This can lead to your drive belt breaking, which will lead to your F-150 becoming completely inoperable. If you are running low, simply top off the reservoir. Be sure to refer to the F-150 owners manual for the proper type. Why you should check: Your windshield washer fluid is, easily, one of the most critical components on any vehicle. Without it, how will you wash away any bugs or bird droppings on your windshield? Sure, your truck won’t breakdown because you’ve run out of washer fluid, but it may be difficult to see out of your windshield if you can’t see! Check your windshield washer fluid when checking all other fluids– every 2 weeks or so. If low, add more washer fluid. It’s recommended to use a product that includes Rain-X, for maximum visibility in even the most inclement of weather. Every vehicle, and every owner, is different. Your F-150 may receive 5,000 kilometers of driving this year, but your neighbors may see closer to 50,000 kilometers. Since everyone has different driving habits, it’s important to maintain your vehicle by your own mileage milestones, rather than assigning everyone the same maintenance schedule for their F-150. 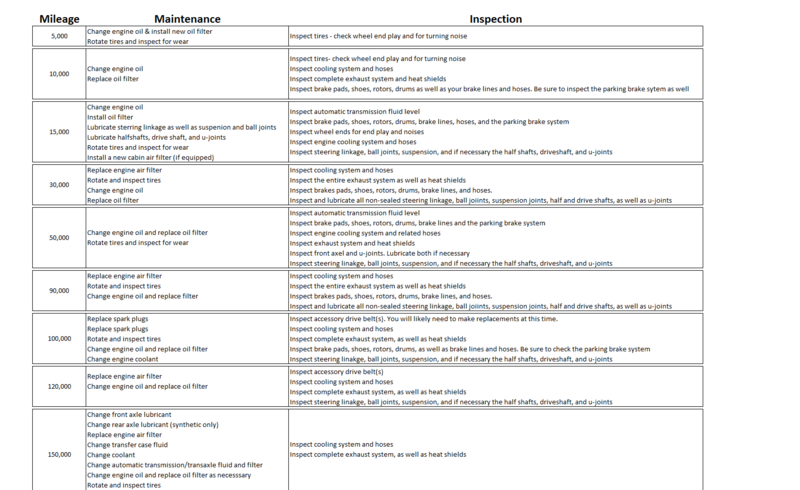 Use the table below to see what you should be checking on your truck throughout its lifetime. 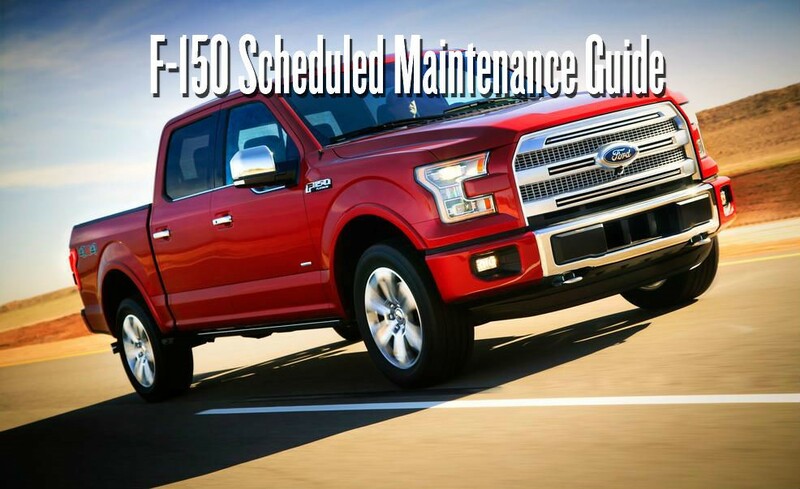 For all other Ford models, check out our scheduled maintenance guide. Our service department is also more than happy to answer any questions you may have about your vehicle. You can even book an appointment for a service checkup right online. Simply fill out the online appointment form to get started!